If something was true in the past, and it is true for the present, we also must see that the Bible is true for the future. Future truth is no less important that the past or present, because future truth matters. Again, future truth matters. If you don't believe me, ask any small business owner about the tax year. If we don't know what the tax rate is going to be for your business, you don't know how to function. You don't know what to do as far as planning, as far as hiring, and as far as what to do with your profits. You just wouldn't know what to do there. So, future truth matters. We need to know the truth about future events. That is true for the Bible also. The Bible talks about the future a lot, a whole lot. Depending on how you classify prophecy, at least a quarter of the Bible's content talks about things that were, and some that are still in the future. It is stuff that is way bigger than tax policy, too. 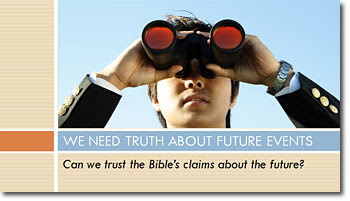 So, the question is, "Can we trust the Bible's claims about the future?" 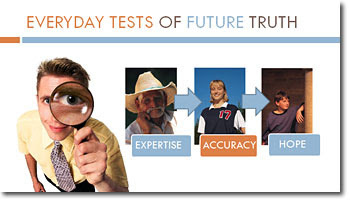 There are some everyday tests of future truth, such as, "Do they have expertise?" Test #7: Do they have expertise? Think about chefs, you know, the people who cook things. I am terrible in the kitchen. I have no idea what happens when you take this ingredient and mix it with that. I know usually the results aren't good, but a chef can tell if you do this and this and this, that you will get this result in the future. They know it. They already have the expertise to tell you that. All I know is if you add bacon, it's going to be good. That is the only thing I can tell you. I believe some things just because I am not the expert. When I look to the Bible, I ask, "Does it have anyone with expertise about the future that I can listen to?" The answer is, "Yes, GOD!" Listen to God. God has the power. Throughout the entire Bible God has showed that He has power over things, since He is sovereign over His creation. He controls the fate of men. He controls the fate of nations. If God can influence the future for those things, I would call that expertise. God is an expert. God has knowledge. Throughout the Bible God shows that He knows all these things that are to come, even places where it doesn't say explicitly that God was going to cause an event. It says He knew it was coming up. He knows the heart of men and knows how they will react. He knows the plans of men along the way. 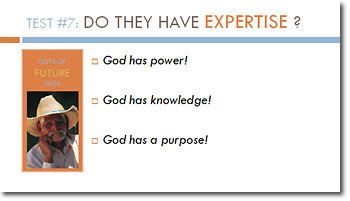 If God can foretell the future, that is expertise. C) God Has a Purpose! God has a purpose throughout the Bible. I see that He knows what He is planning. Not only is He sovereign and in charge, but He knows where He is going. The entire Bible is a whole story focused on the theme of Jesus and where He is going. Jesus has come and He is coming again — that is the theme of the entire book. God is able to plan this all out and orchestrate it, so I call that expertise. Since God knows what is going to happen, it seems silly not to trust the expert. The Bible's got a pretty good expert concerning the future. It passed that test! Another test for future truth has to do with accuracy. Has the Bible been accurate in the past? Test #8: Has it been accurate? I think about a television show called "Storm Chasers." If you have every watched it, it is fun. These guys go around chasing tornados with their weather vehicles trying to get data. It shows these two different crews. One has a guy who is successful all of the time, and another guy who blows it because he can't seem to get the information right. If I am going to go out there and I am going to hit a storm with somebody, I want the successful guy with me, because he has been accurate in the past. I believe some things because they are usually right. And, anytime you want to learn about the future, you want to learn from someone who is going to be right, right? So, what happens when I apply this to the Bible? Well, guess what? It's been right! It's been accurate! Prophecies have been right in the past. If it were made up by men, I would expect it to be full of stuff that fails. The Bible even says so itself in Deuteronomy 18:22. It says, "You may say to yourself, how can we know when a message has not been spoken by the Lord? If what a prophet proclaims in the name of the Lord does not take place or come true, that is a message the Lord has not spoken. That prophet has spoken presumptuously. Do not be afraid of him." Guess what? The prophets in the Bible, they were right! The biblical prophets predicted all sort of future things. They predicted that Assyria and Babylon would swing in and conquer Israel and Judah decades before it happened. Prophets predicted that the Israelites would return from an exile after 70 years of captivity, and they did. Prophets predicted the appearance of the Messiah. It shared details that would apply to His life, like the Virgin Birth, Him being born in Bethlehem, and that He would come into Jerusalem riding on a donkey. We can see all these things happened, and we can see the manner of His death being prophesied and it was fulfilled exactly the way it was supposed to. 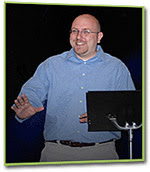 Those prophecy success stories weren't just chance. The odds are too big. You can't just say that it just randomly happened that way. There is no way it could have happen unless it was a truthful and accurate prediction, and not just a guess. The Bible shows in past predictions it has been accurate. The Bible is accurate in the present, too. It continues on to today. All I have to say is, "Israel, it exists!" What else do you have to say? What other group comes back after centuries, almost two millennia away from its homeland and is restored as a nation? The Ottoman Empire? No. The Huns? No. Israel, yes, because the prophecies are there. 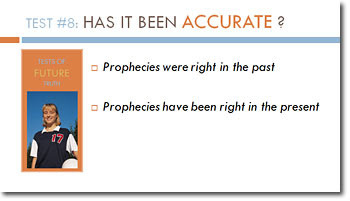 The accuracy of the Bible in regard to prophecies is amazing! Its accuracy makes me believe that it is true.